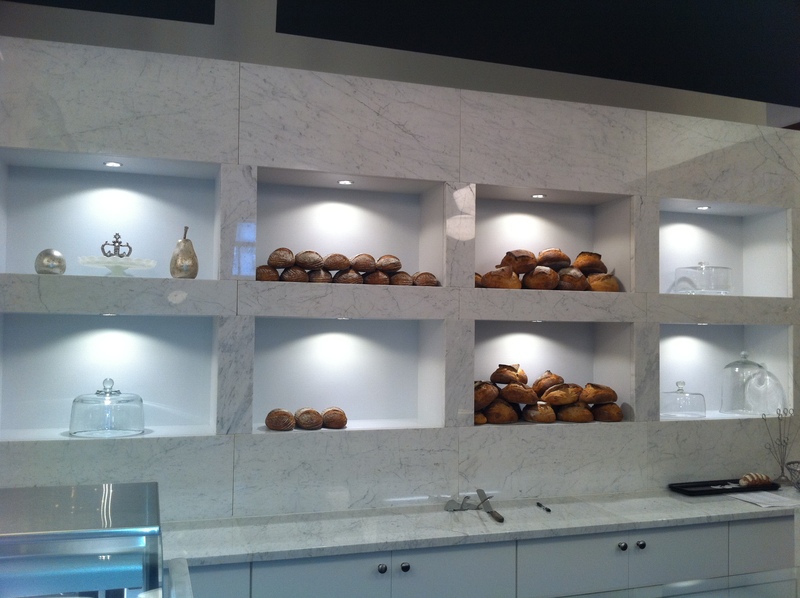 Queen of Tarts Bakery & Bistro is finally open and can be found at 10129 104 Street in Edmonton (sorry Calgary). I was lucky to walk through the door five minutes after it officially opened, and was greeted by the beautiful and enthusiastic Jelena. 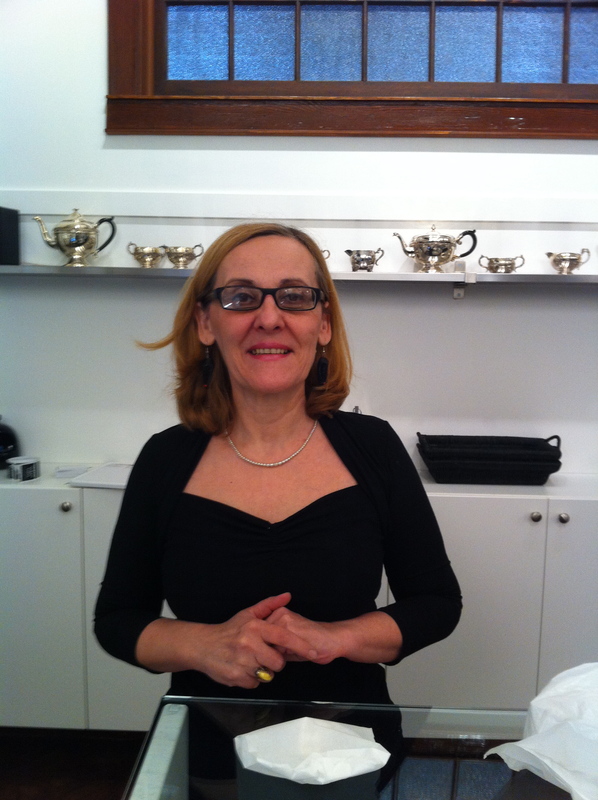 If Jelena looks at all familiar to you, she hails from Cally’s Tea’s at 8608 – 99 Street. Jelena had been keeping me updated on the progress of the opening of Queen of Tarts each time I went in to buy my beloved Earl Grey tea. All the staff looked lovely, happy and calm in sleek black. I wanted to take a pic of the Queen of Hearts herself, Linda Kearney, but I was forbidden. Although Linda looked fabulous and smart and grand in her black, she had that look in her eye like a woman does when someone wants to take a picture of them when they have a curler in their hair and their nightgown on. I can respect that, but Linda, I will be back. I work in the area and was eagerly awaiting the opening of Queen of Tarts. No offense to the Standard Life Food Fair people, but I’ve been desperate for a little quiet place to hide from work for a few minutes each day, and Queen of Tarts fits the bill perfectly. The space, although in the lower level, has a grand staircase to take you below street level, and has a high ceiling with bright natural light pouring in from the windows. If it weren’t for the stairs, you’d have no idea you were in a basement. 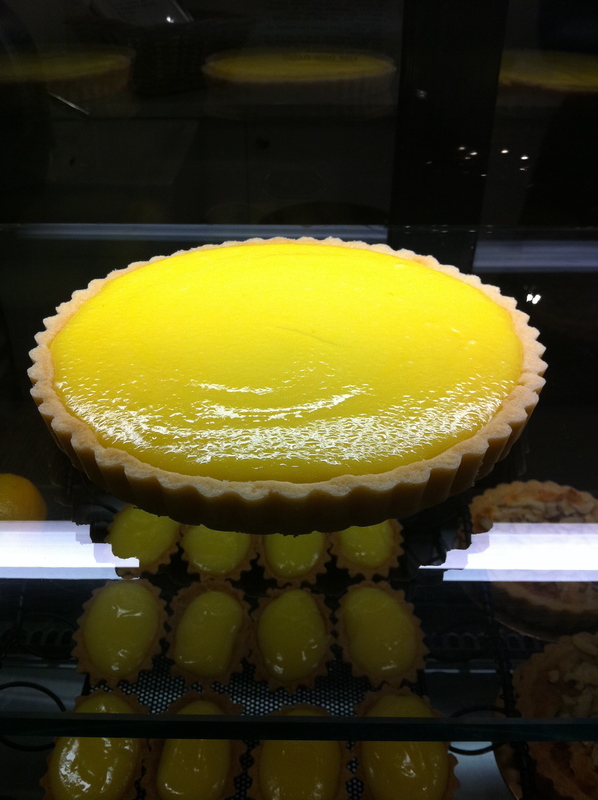 Although I first laid eyes on the sweet treats in the display case, Queen of Tarts is more than tarts. 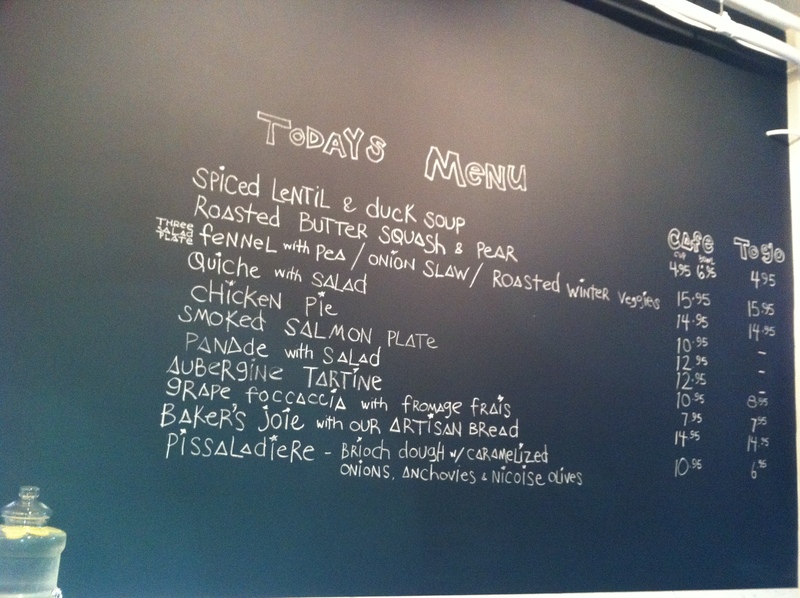 They have lovely breads, quiche, and a nice lunch selection as you can see in their menu above. Yum. I’m having a moment. 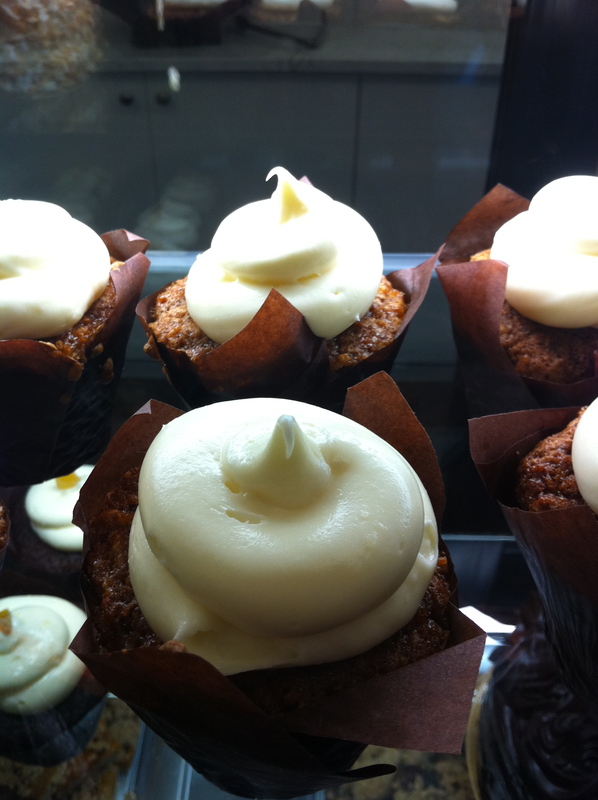 For my friends who can’t have wheat, the above is a carrot cake that is made without flour. Without flour! I don’t know how this can be, but it is celiac friendly. 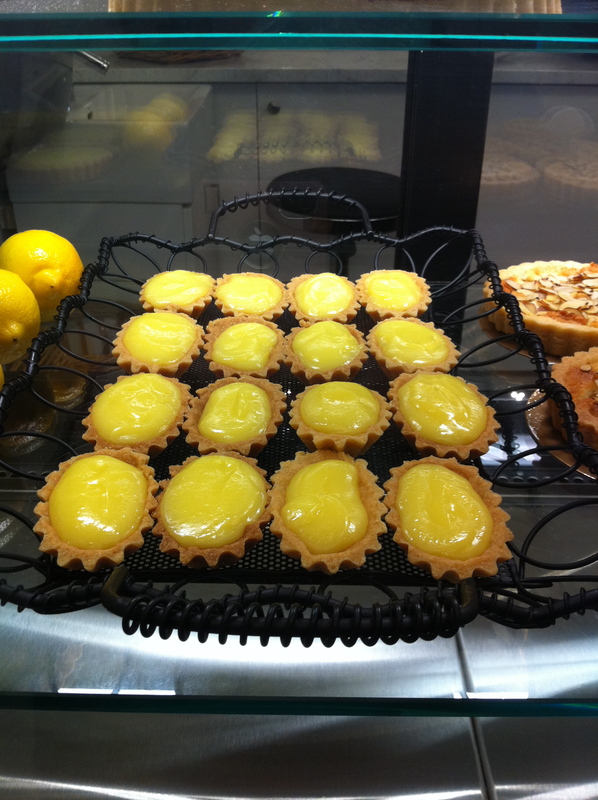 Above we have the large lemon tart, and below, the mini lemon tart for those days when you don’t want to share. Below is a beautiful specimen of the pear tart. A perfect thing to have with your afternoon tea. Or for dessert. Or for a late night treat after a bag of Doritos. Or, heck, for breakfast. 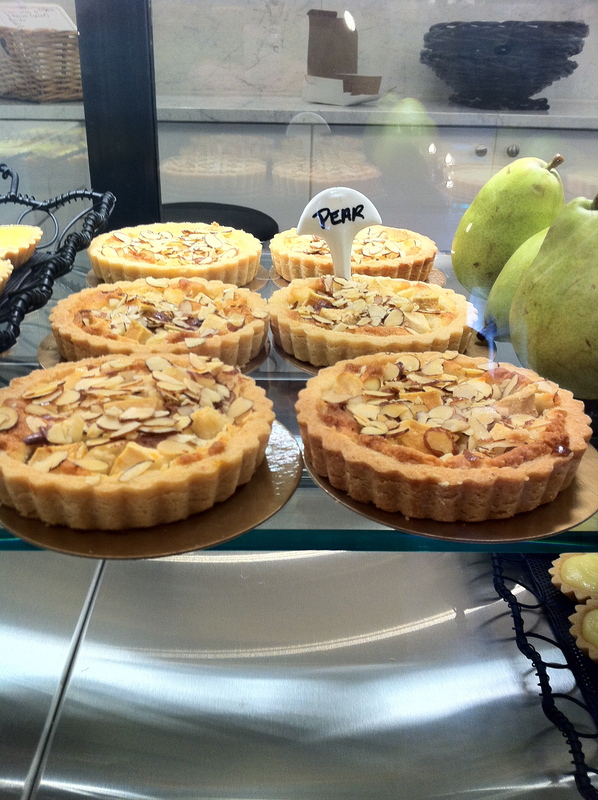 Life’s too short to deny one’s self a good pear tart when the mood strikes. I wanted to share the joy of the opening, and took a wee sampling back to work with me. It included: date, apricot and lemon coconut squares, brownies, a meringue, and lemon and lime tarts. Comments I received were all positive. I tried the lemon coconut square, and was delighted. 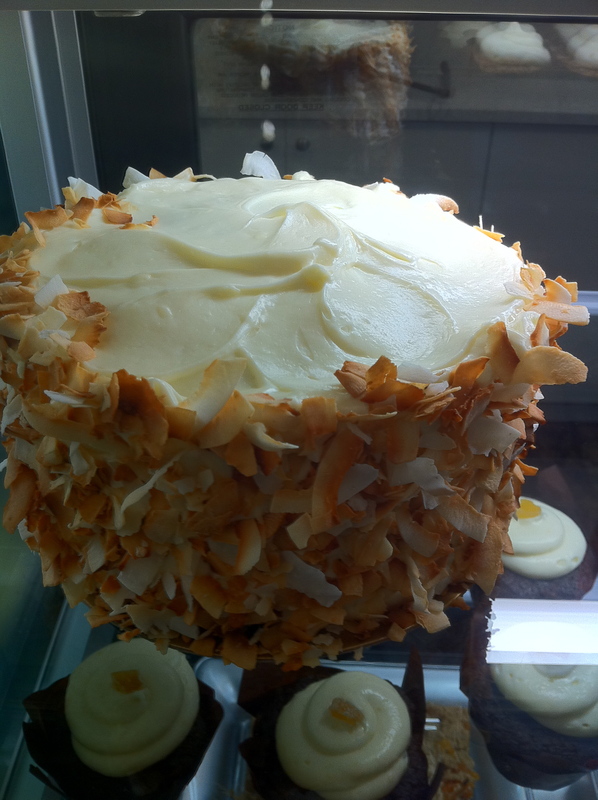 It wasn’t too sweet, had just the right amount of lemony zing, and the coconut was fresh and delicious. It was a lovely thing to have to brighten a wintery day. PS: I ran into Sharon from Only Here for the Food, a dear fellow foodie. Unlike me, Sharon knows how to use a camera properly. She took some great interior photos. The customer in the one photo is yours truly. My Gawd, those lemon tarts look good. 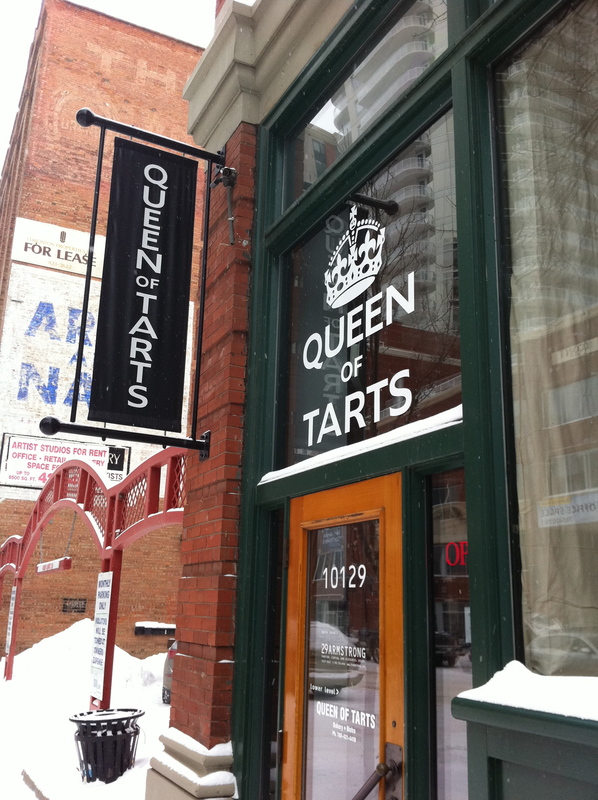 Must check out the Queen of Tarts STAT! I am sad I wasn’t standing at the door with my nose pressed against the window like you! I would have been, had I known! Will definitely be dropping by on Saturday with the rest of the city! Thanks for feeling sorry for us poor schlubs in Calgary. Valerie! You should have seen us. A bunch of us from work headed over at 9:00 a.m. (the posted opening time), and it was closed! All four of us had our noses pressed up against the glass in disbelief. One of us was ready to smash the door down anyway *cough* Roxanne *cough*. It wasn’t until after a minute of whining we noticed the sign inside that read, “Opening today at 11:00 a.m.” You’ll be safer on Saturday. Have you gone yet? How about now? Thank you so very much for all of your wonderful praise. I just wanted to let everyone know that we will open our doors at 11:ooam on Saturday instead of the posted 9:00am. Yummy for my tummy, and especially my wife’s tummy – she’ll love this place!